As previously noted, I really enjoyed the Rethinking Conference in Sydney a couple of weeks ago. It provided plenty of food for thought. 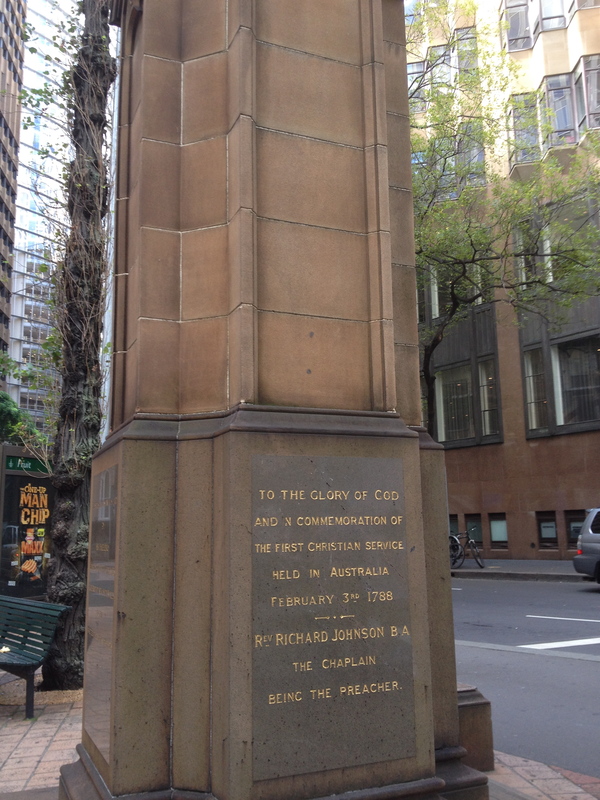 Someone I learned a bit about was Australia’s first “public Christian”, Richard Johnson. The Tuesday night public lecture by Miroslav Volf was the Richard Johnson Lecture, and I have to confess that despite growing up in Sydney and studying the First Fleet in both primary and high school, this name didn’t ring any bells for me. John Dickson gave us his biography, and it was a fitting tribute to a man who by all accounts sought to follow Jesus and whose faith compelled him to seek to work for the good of society. He was praised by convicts as the “physician of body and soul” and remembered as one of the few who was willing to visit convicts who lay dying in the putrid conditions of the disastrous Second Fleet. Details are sketchy, but evidence that he was willing to present himself as a “hostage” to an Aboriginal community to guarantee safety for the leader talking to the Governor, and that he gave his daughter an Aboriginal name, suggest he interacted more graciously with indigenous people than many others. It speaks well of him that he had been commended for his role as the new colony’s first chaplain by leading evangelicals of the day including gospel champions John Newton and William Wilberforce. 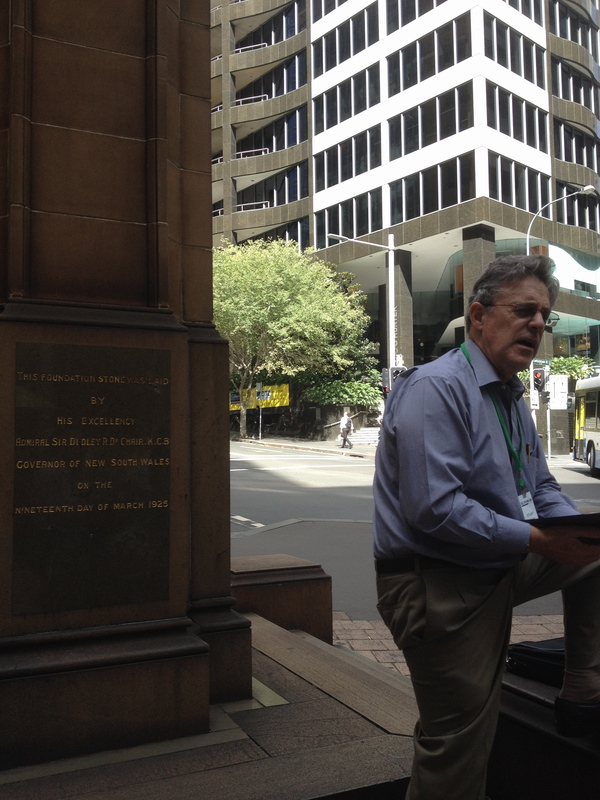 On Wednesday afternoon for my elective I was part of a small group walking tour with historian Stuart Piggin. 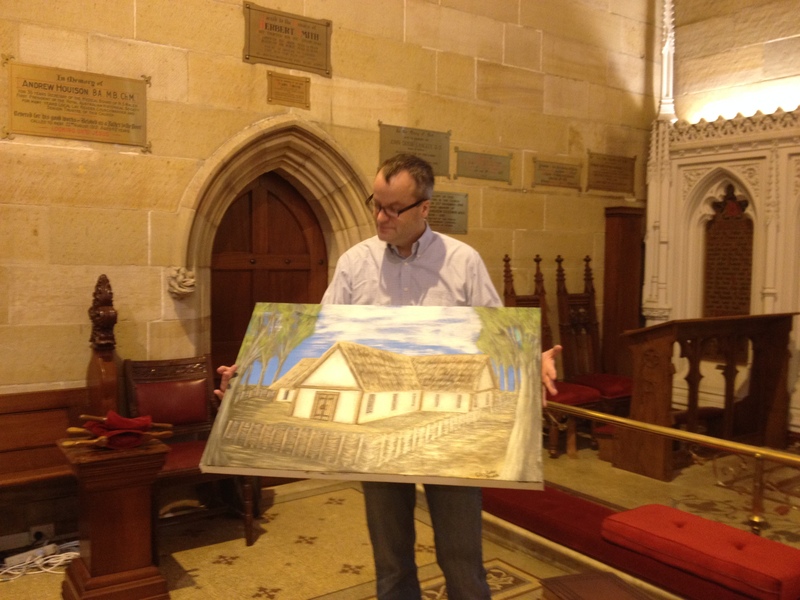 We visited the site of Australia’s first church service, as well as the first Anglican and Catholic churches. Stuart spoke of the challenges Johnson faced in his role, particularly as he sought to balance his calling to preach the gospel and care for the lost and the least with the public position he was given as magistrate. His successor, Samuel Marsden, is far better known than Johnson, but for all the wrong reasons, as “The Flogging Parson” who seemingly enjoyed his punishing role. 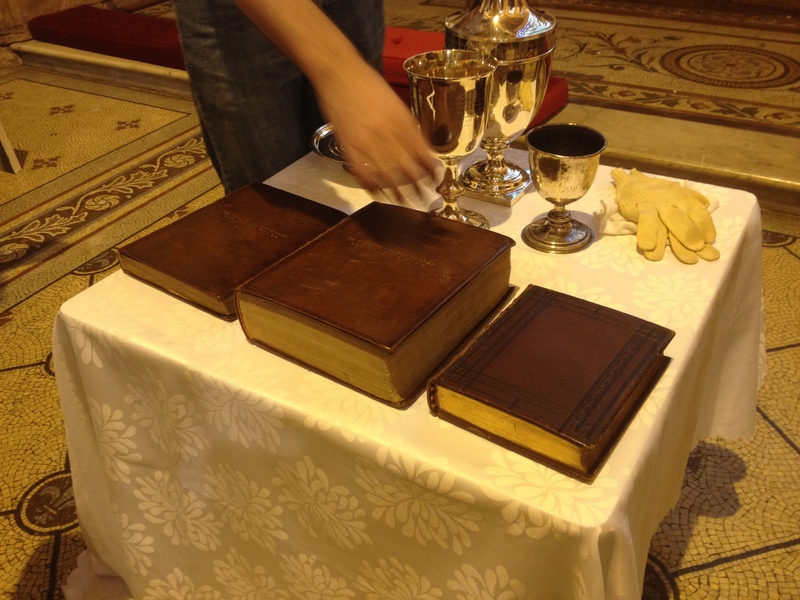 At St Phillips Church we were able to see and read Johnson’s Bible, from which he preached the first sermon in the colony on Psalm 116:12 “What shall I render unto the Lord for all his benefits to me.” It was interesting to speculate on his intentions in choosing that text. 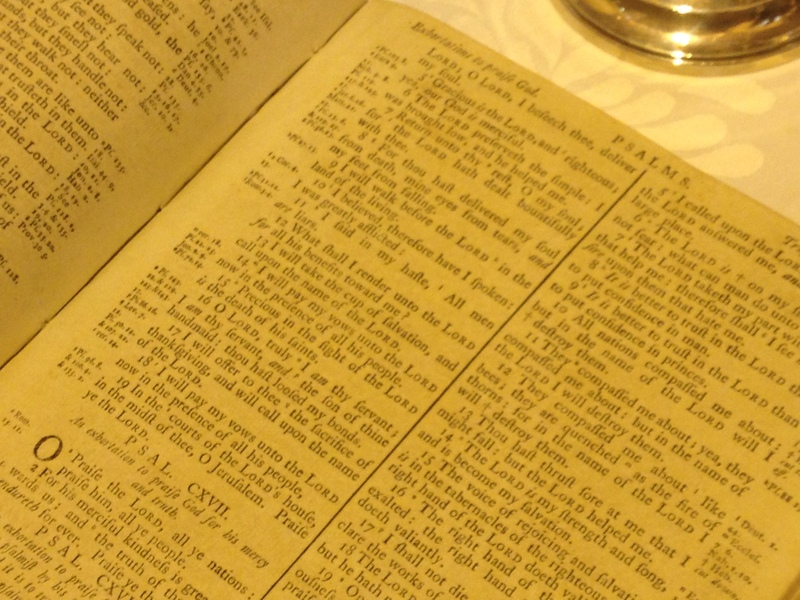 We also read from his prayer book, which had a nice connection for me as it would have been from this book that he read the wedding service at the marriage of two sets of my great-great-etc grandparents – William and Mary in June 1788, and William and Kezia in August 1793. Our context today is so very different from Johnson’s. He is an example to emulate and learn from, but also a reminder of the dangers of mistaking publicly expressed faith for publicly enforced faith. Volf’s lecture presented some interesting continuities and discontinuities with Johnson. The commendation to Christians to be people who work for the good of society as a whole, demonstrating compassion and care for all, regardless of their status or beliefs, is one he seems to have lived out well. The warning, however, that Christianity is in great danger of compromise when it finds itself aligned with power, is one that he and his contemporaries did not heed. Two hundred and twenty five years later, Australian Christians are still dealing with some of the fall out of those decisions. For some churches, recognising that taking on positions of societal power and authority has damaged their witness to the gospel, and reversing the consequences of those positions, is still very much a live issue. My own context as a Baptist is a little different – there is a sense in which our movement realised 400 years ago that the church operates best from the margins, as an alternative community seeking to influence, challenge and bless the society in which we live, rather than control it. (When Volf commended the ideas in a 17th century book by “someone you’ve probably never heard of,” Thomas Helwys, a few Baptists in attendance were quick to let him know we certainly are aware of the thinking of this pioneer of our movement!) And yet we can still suffer the remnants of a cultural or ideological “Christendom” – the thought that the church by nature ‘should’ be central or powerful in Western society. Perhaps there is some deep-seated and long-standing “unlearning” for Christians as we engage in the public sphere, recognising our positions as a minority view, without entitlement, and perhaps even willing to embrace the maltreatment that may come from being “outsiders,” as Jesus himself did. As someone who now calls South Australia home, I also had opportunity to reflect on our different history, with this state founded as a “dissenters’ paradise,” where settlers sought to provide space for the exercise of non-conformist religious and political beliefs freely. In theory, what Volf explained as Christianity’s ability to embrace political pluralism whilst maintaining religious exclusivism, is how we have lived here for the past one hundred and eighty years. 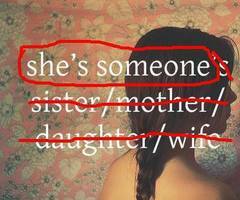 And yet it can sometimes seem that the greatest barrier to the positive contribution and witness of public Christianity today is our own failure to understand and embrace the lack of power, entitlement and status inherent in who we are called to be. What do you think?